It starts like a fog machine, deploying its vaporous mist into the air—until the cloud it emits holds its exquisite shape and silently hovers mid-room for hours. 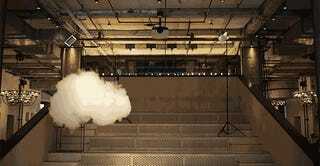 This is the drama and allure of Nimbus, the physics-defying work of Dutch sculptor Berndnaut Smilde. A video crew from NeueHouse captured the artist in action while preparing a cloud-room for the Frieze art fair this week in New York.